Glucerna shakes are delicious grab-and-go meal or snack replacements designed for people managing their blood sugar. Glucerna Shakes have CARBSTEADY, unique blends of slow-release carbohydrates to help manage blood sugar,* as well as 10 grams of protein, 180 calories, and essential vitamins &amp; minerals. They are suitable for lactose intolerance and are gluten-free. Glucerna is the #1 brand recommended by doctors for people with diabetes. *Designed to help minimize blood sugar spikes compared to high-glycemic carbohydrates. Glucerna shakes are delicious grab-and-go meal or snack replacements designed for people managing their blood sugar. 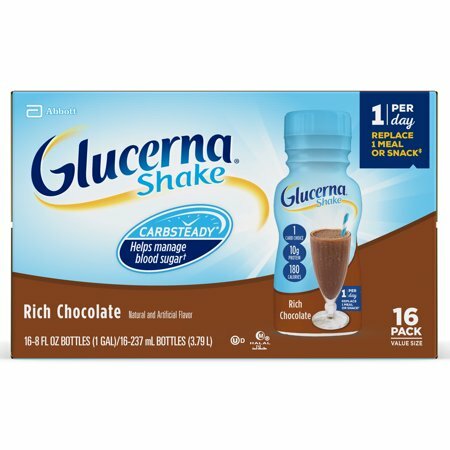 Glucerna Shakes have CARBSTEADY, unique blends of slow-release carbohydrates to help manage blood sugar,* as well as 10 grams of protein, 180 calories, and essential vitamins & minerals. They are suitable for lactose intolerance and are gluten-free. Glucerna is the #1 brand recommended by doctors for people with diabetes. *Designed to help minimize blood sugar spikes compared to high-glycemic carbohydrates. Ingredients: Water, Milk Protein Concentrate, Canoloa Oil, Glycerin, Corn Maltodextrin, Fructose, Cocoa Powder (Processed with Alkali), Soy Protein, Less than 1% of: Corn Oil, Short-Chain Fructooligosaccharides, Potassium Citrate, Magnesium Phosphate, Cellulose Gel, Natural and Artificial Flavor, Salt, Choline Chloride, Ascorbic Acid, Calcium Carbonate, Monoglycerides, Soy Lecithin, Sodium Citrate, Cellulose Gum, Carrageenan, Sucralose, Potassium Chloride, Potassium Hydroxide, Turmeric Color, Acesulfame Potassium, Calcium Phosphate, Potassium Phosphate, Ferrous Sulfate, dl-Alpha-Tocopherol Acetate, Magnesium Chloride, Gellan Gum, Zinc Sulfate, Niacinamide, Manganese Sulfate, Calcium Pantothenate, Red 3, Copper Sulfate, Vitamin A Palmitate, Thiamine Hydrochloride, Pyridoxine Hydrochloride, Riboflavin, Chromium Chloride, Folic Acid, Biotin, Sodium Molybdate, Potassium Iodide, Sodium Selenate, Phylloquinone, Vitamin D3, and Vitamin B12. Instructions: . Shake well. Serve cold. Glycerine is a great way for a diabetic to have a quick meal and keep your blood sugar levels in check. I am a chocoholic so it works double duty. Even if you are not diabetic you can use this for a healthy meal replacement. This product CAN give you nutrition daily. It's not crunchy food but WORKS. I've kept my stupid blood sugar under control with it. A very good possible option for you. I purchase these for my Diabetic Father who is experiencing a loss of appetite. These are easy for him to grab for a quick, not empty calories snack, he enjoys them chilled! Cost wise, the 16 pk (i've only found here) ounce for ounce, while not cheap, is definitely less than the supermarket price. I have them delivered, which is a huge help especially when you catch a shipping cost that's flat rate or free. The package was also delivered on the date scheduled. Thank you Walmart ! This supplement "blows away" Ensure and offers similar products. Glucerna Shake boxes were packed well in shipping containers and arrived in good condition. They were all within the best if used by date.